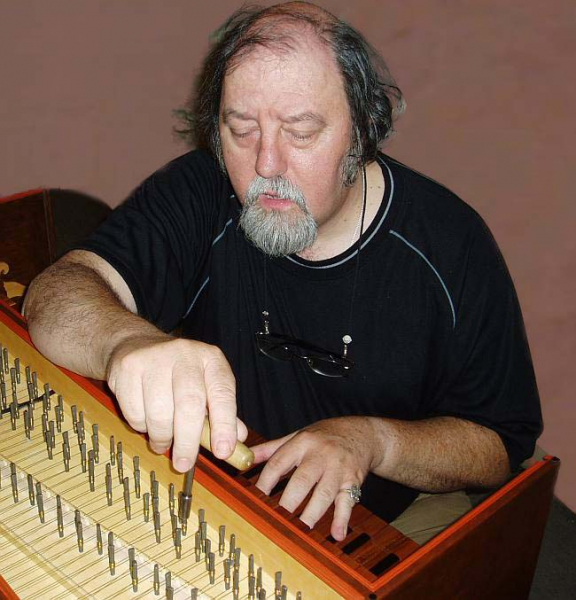 The featured instrument was built by the workshop Jan Bečička & Stanislav Hüttl & Petr Šefl, Hradec Králové, in 2005.It is modelled according to the two-manual harpsichord of a German type, the historical instrument conserved at Charlottenburg, built by Michael Mietke (Berlin) in about 1710. The measures of the modern replica we recorded are taken from this historical instrument which served as a template. Strings are from brass. Tuning was set to the original 415 Hz. The compass is FF-f3 with disposition I 8´, I 4´, II 8´, II buff stop (Laute). Manual coupler. The instrument is remarkable by warm, gentle, colorful sound, which, especially in descant is not that sharp and strident, but more piano-like. 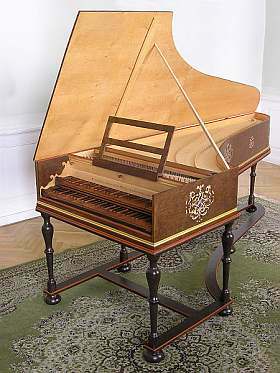 The historical original (the template) of this harpsichord is today in the ownership of Staatliche Schloesser und Museen, Berlin, deposited in Charlottenburg. It was built between 1703-1713 by Michael Mietke. This estimation is based on the fact, that harpsichord had to be japanned before 1713 and its original compass is thought to be later than 1703. The instrument is mentioned as „the black harpsichord.“ Originally, its compass was FF,GG,AA-c3 (fifty-four notes), strings from brass with pitch A = 395-400 Hz. Later in the eighteenth century, the compass was extended to FF,GG-e3 (fifty-nine notes). The keyboards were moved two courses of strings towards the bass. Descant strings changed to iron ones and the pitch was set higher to 415 Hz. The harpsichord was originally made for Queen Sophia Dorothea of Hanover, mother of Frederick the Great, and placed in her private palace of Monbijou and worked on by Johann Rost in 1720. It was brought to Charlottenburg Castle in modern times. Hauptwerk v.2 and higher supported. 24 bit samples, 48kHz resolution, virtually noiseless. Original tuning of the Mietke harpsichord from the Charlottenburg is unknown. We used very slightly modified Kirnberger III when recording the instrument, a = 415 Hz. The virtual model of the harpsichord offers also various combinations of stops recorded together to allow for even higher degree of reality than that achievable with the digital synthesis of the individual samples. See the Virtual console page for details. The Hauptwerk 2 layout consist of a single display page. In the centre, there is a view of the harpsichord from the performer's perspective with clickable manuals at the bottom of the screen. These are normally operated by a midi keyboard attached to the PC. The small buttons above the keyboards have no functionality. Originally, they serve to change the stops of the harpsichord. We deliberately made new and much larger drawstops, since these buttons would be too small to click or switch with a use of a touchscreen. In the left upper corner of the screen, the harpsichord model offers two stops for the lower keyboard, of the 8' and 4' pitch respectively. Also, there is a coupler to be found which couples the upper keyboard to the lower. The next column of the stops is labeled with a word "combination". These are various combinations of stops recorded directly on the original instrument, allowing thus for greater realism than if the stops are drawn individually in Hauptwerk and assembled digitally by Hauptwerk audio engine. In the right upper corner of the screen, there are switches for the upper manual. It is a single 8'stop. However, its timbre can be changed to a buff stop (Laute). Therefore, the switches operating the 8' stop and the buff stop are mutually exclusive. The ODF for the Mietke Harpsichord. You need to have downloaded and installed the instrument first. This is the ODF update ready for the Hauptwerk 4 use. Extension package for Hauptwerk 3.22 and higher. More virtual stops added to manuals (16', 4' and 2') and virtual independent pedal with 3 stops added.